Wil, Zürich, Switzerland is home of the Angst family since ages past and in the present. The town of Wil is small, friendly. The town hall (rathaus) is modern. There is little of "old" Wil left. One has to go next door to Rafz to see half-timbered buildings in numbers that suggest the past. If one goes to the Wil cemetery, one finds a modern church and hundreds of gravestones, many of them with the surname Angst. Many are shown below. There are certainly others that we have missed. Each trip to Europe brings more information and expands these web sites. The graveyard is beautifully kept. 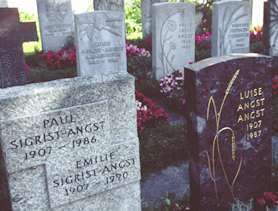 Because the images are small to suit a web page, the Angst family names are listed with the images. Front row, left to right; Ernst Angst-Lechner 1900-1986, Edvard Lechner-Angst 1898-1981, Ernst Angst 1899-1981, Arnold Angst 1960-1981, - , - , Ernst Angst 1927-1981, Klara Angst 1930-1982 & Emil Leu 1932- , Emil Angst Siegrist 1891-1982 & Emma Angst. We wonder if the Emil Leu is related to the Leu's of Kansas. 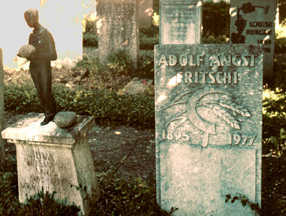 Paul Sigrist-Angst 1907-1986, Luise Angst 1907-1987 (this photo is the row behind the church photo, and to the right). Left photo; Hermine Angst-Rengel 1897-1987, Anna Angst-Rüeger 1912-1987, Jakob Angst-Heller 1897-1937 & Anna Angst-Heller. 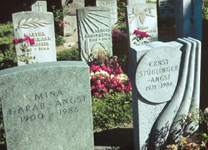 Right photo; Mina Garab-Angst 1900-1986, Ernst Stühlinger-Angst 1921-1986 and behind Arnold Angst-Layer 1897-1964 (this photo is the row behind the church photo, and to the left). Michigan Storrers trace their family back to Siblingen and Eliza Angst of Wil, Zürich, Switzerland. We can trace the Angst family back to about 1614 in Wil. 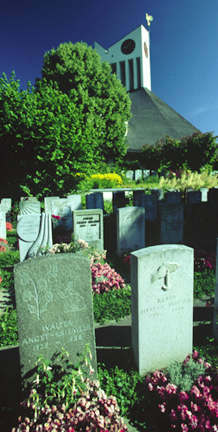 Eliza's father, Salomon (1785-1849) married Dorothea Weber of Siblingen, so it is not surprising that Eliza met and married someone from the same town as her father's wife. The Webers of Siblingen have long been one of the major families in that town, and the genealogy developed jointly by this web-site producer and Walter Weber of Switzerland (born in Siblingen) fully documents the Storrer and Weber families from before 1600 to the present. The route from Wil to Siblingen is through Germany where it almost cuts Schaffhausen canton off from the remainder of Switzerland. Wil to Rafz, then over the mountain range into Germany at Beltersweil,northeast to the border in a mountain valley, on to Wilchingen, then Neunkirch, Gächlingen and Siblingen. Today, neither border crossing is manned, while the route around the east end of the mountains means two passport stops.